"That experience you have when you’re younger — you get together with your friends, you go down to the basement, crack open some beers and play — it’s right there in these tracks." Try to nail John Petrucci's six-string arrangement of Chopin's Piano Concerto in A minor, Opus No. 2. Dream Theater's guitarist breaks down the intricate, twisty riff to "Barstool Warrior." Dream Theater's guitarist discusses the inception, conceptual and technical approaches he and his bandmates took in writing and arranging "Untethered Angel." The band's 14th studio album, 'Distance Over Time,' is out February 22. Dive into the second part of John Petrucci's arrangement of Chopin's Piano Concerto in A minor, Opus No.2. Dream Theater Premiere New Song, "Fall Into the Light"
Learn how to master sweep arpeggios from John Petrucci. The band’s 14th studio album, ‘Distance Over Time,’ is out February 22. Dream Theater Share New Song and Video, "Untethered Angel"
The band's forthcoming album, 'Distance Over Time,' is out February 22. 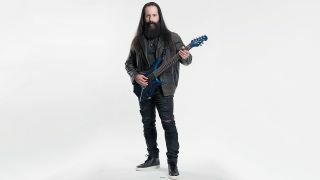 Learn some tricky, but incredibly effective, warmup exercises from John Petrucci. The band's new album, 'Distance Over Time,' is out February 22. The band's 14th studio album is out February 22.